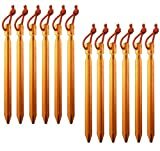 Tent stakes are the pillars that support erect tents. Every adventurer must have fit tent stakes. Otherwise, their tent won’t be strong. When it comes to selecting stakes, it is important to select lightweight but effective stakes. You don’t want to be carrying very heavy stakes on your back. These stakes are metallic. The best stakes for hard and rocky grounds are titanium stakes. If well-driven into the ground, they make the tent sturdy. Titanium stakes require extra strength to nail them into the ground. The heavier the stakes, the better the quality. Aluminum stakes are light but strong. 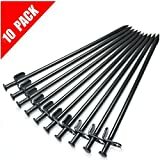 They are the best tent stakes for backpacking. Aluminum stakes are cheaper than titanium stakes. If you are erecting your tent in a windy area with hard soils, consider getting forged steel stakes. If you are camping in an area with soft soil, consider buying stakes designed for loose soil. The stakes should be lightweight with graved sides for grasping firmly into the ground. Aluminum alloy stakes are best for soft grounds. Stakes for soft grounds should not necessarily have a wide head since they may not require much force to drive them into the ground. These are stakes designed to work in all soil conditions, from sand to snow to rocky, and desert soil. Most of them have a Y design. Most of the companies selling tent stake snow sell products that don’t work well in snow. They are lightweight with long shafts and have sharp tips. They may be made from Titanium or aluminum. Type of soil. It is essential to consider the type of soil in the area you will be erecting your tent. For areas with sandy soil, you can buy simple and moderately sturdy stakes. Rocky areas will work well with strong and metallic stakes since you will be required to hammer the stakes and drive them into the rocks. Weight. Most outdoor adventurers consider aluminum tent stakes lightweight as they can be easily packed into their backpacks and be carried around. The shape of the top and the tip. A good tent stake should have a wide head to provide a large surface area for hitting it with a mallet drive. They should also have a tapered tip to allow better penetration into the ground. Intended use. If you are building a temporary temp for a few days, you should consider buying stakes that are lightweight and easily portable. However, if you want to erect a tent in your backyard for your children, you should consider buying sturdy tent stakes. Reflection and pull codes. A reflective code makes the tent visible and conspicuous. Visibility of a campsite is very important as it reduces the chances of accidents at night. Material. The material used to make the stake determines its strength. For instance, galvanized steel is stronger than aluminum alloy. There are stakes made with carbon fiber and are as strong and lightweight as those made with titanium. The amount of metal in the stakes also affects their strength. Thin stakes will definitely bend faster than thicker ones. The best tent stakes are those that are thick and wide. Galvanized steel tent stakes are the best heavy duty tent stakes. However, these are heavier to carry. The orange screws are mostly advertised as the ultimate ground anchors. They are the best type of tent stakes available in the market today. The screws can withstand a lot of pressure making them indestructible. The stakes have been used on the beach, in the rocky grounds, in the ice, and on soggy California grounds. 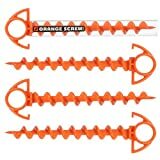 While orange screws keep the tents secure even when in strong winds, the large screw weighs 3.6 ounces. This is very heavy for backpacking. Even the smaller screws measures 1.8 ounces which is still heavy. Also, consider adding some tape on the tips of the screws when backpacking since they are very sharp. Orange screws are produced in the United States using 100% recycled materials. 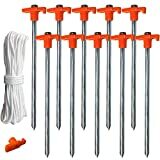 The primary use for orange screws is anchoring a tent. However, they can serve the adventurer in other ways like securing the horse and dogs. The screws would be much better if they had a bigger paracord loop on the eyelet. Orange screws are the best tent stakes for wind. 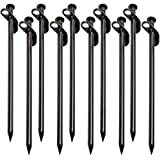 These tent stakes are specially designed to serve multiple purposes like erecting a tent, tarps, and canopies while camping. The stakes are long and large which gives your tent maximum support and anchorage. The head has a hook and a hole which makes it easier to erect a tent. The stakes are made with forged steel, a heavy-duty metal that is corrosion resistant. This material makes the stakes durable. They are sturdy and can withstand a lot of pressure without bending or breaking. Eurmax Heavy Duty Steel Tent Stakes has sharp tips which penetrate the ground easily. The tent stakes are a perfect choice for backpacking as well as outdoor camping. This is among the best tent stakes for many reasons. First and foremost, it is ideal for camping in rocky and rugged areas. The stakes have milled points which make them easily penetrate in rocks and hard surfaces. It also has a wide head, which provides a bigger surface area for hitting with a mallet driver without missing. The head is made with hard PVC material which has a rope-stringing eyelet and a hook, which provides better anchoring capabilities. The other good reason for buying this stake is that it is made with galvanized steel; thus, it is non-corrosive. The stake is durable and will serve you well in all your adventures. It is a prerequisite too for landscape trim, anchoring tents, and canopies. The stakes are made with galvanized steel which is corrosion resistant and strong which makes them the ideal tent stakes for rocky ground. They are almost unbreakable and can withstand pressure. With these stakes, you won’t have to worry about bending or snapping. They work well in rocky areas, grassland, and snowy grounds. The stakes have a hook to prevent them from disappearing into the ground. They also have an eyelet to pull them out. BareFour Tent Stakes come with two packaging bags. Be careful not to rip the bags as you unpack the stakes. Despite being made of steel, BareFour tent stakes do not require a lot of effort to drive them into the ground. They have a large head which minimizes the chances of missing the stake. Unlike most stakes, BareFour tent stakes should be driven into the ground at an angle of 600. This is among the best tent stakes for sand or snow. The 7075 aluminum material makes them lightweight, but they are strong enough. However, they can only support a limited weight. The stakes are scoped and drilled on the shafts to ensure they have a tight grip on the loose sand on snow ground. The sand or snow will flow into the holes on the side of the stakes and provide a firm grip; thus, anchoring the tent. When you are done with your camping adventure and want to remove the tent, you can insert removal ropes into the hole in the stopper. These outdoor aluminum stakes have a three-sided structure which ensures they have a tight grip on the ground. Also, they are seven inches long which allows them to go deeper into the ground and give a firm grasp. The Y design is perfect for penetrating and gripping the ground of various soil types. Their color makes them easily visible. The stakes have an awesome design. They are long and measures about ten inches. ABCCANOPY tent stakes are made from galvanized steel which makes them corrosion resistant. They are the best stakes for erecting tents in harsh weather conditions. They have polypropylene tops which make them strong enough to endure heavy hammering as they are driven into the ground. Each pack consists of ten pieces and four tent ropes which make the work of erecting a tent much easier. ABCCANOPY tent stakes also have arched tips which offer better anchorage into the ground than most of the stakes in the market. 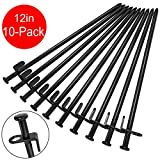 By far, they are the best tent stakes for hard ground. They are best suited for erecting tents that are tritone in shape. KUNGIX tent stakes are the best choice for securing tents as well as shelters in all soil conditions. However, there are complaints that they do not work so well in sandy conditions. The stakes have a reflective cord which aids in identification at night, and when they get lost. The cord also helps prevent injuries and breakage of the stake. They come with a pouch for storing them and carrying them around. 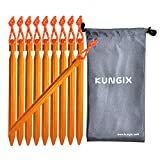 KUNGIX stakes are sold in 10 pieces kits which make them sufficient to erect a tent. Another reason for buying the stakes is they are much stronger compared to other 7001 aluminum stakes available in the market. They have a Y shape which allows them to penetrate in different types of soil. The stakes are lightweight and portable. Each piece weighs 0.46 oz/10 g which means they can be packed in your backpack without adding to much weight on your back. The tent stakes come with a waterproof pouch for storing and moving them. Pouch for storage and portability. One pack contains ten pieces, and each piece is 12 inches. They are made from galvanized steel which makes them strong and durable. These stakes are corrosion resistant. Also, bending or snapping is quite rare for these stakes. BareFour tent stakes have a large head which makes it easier to drive them into the ground. They also have sharp tips which penetrate into the ground easily. The tent stakes have a hook which prevents them from getting too deep into the ground and an eyelet which facilitates pulling the stakes out of the ground. The stakes can be used on different types of grounds including rocky ground and loose sand. BareFour also packs the stakes together with two storage bags. Buyers are cautioned to open the package carefully to avoid tearing the bags. For them to work in soft soil, you have to be creative. Each pack has ten pieces of 11.8 inches which are long enough to give your tent maximum support. They are made with high tensile steel material which enables them to penetrate even in the hardest ground. The hook and the eyelet facilitate pulling them from the ground. 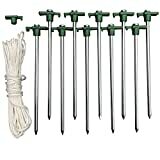 The tent stakes can be used to erect a tent, tarps or canopies. They are ideal for outdoor adventures and backpacking. Each pack comes with ten pieces, one green stopper, and four ropes of 10 ft. The tent stakes are made from galvanized steel which makes them corrosion resistant. They have a large head for mallet driving and sharp tips which easily penetrate into the ground. They are perfect tools for anchoring a tent, canopies, and garden structures. They can anchor the tent in strong winds, sandy soil, grasslands, or rocky soil. The products reviewed above are the best in the market. The adventurer can find what best suits them for their next adventure. Choose the tent stake depending on what you want. For those going for outdoor adventures, consider the lightweight tent stakes that can easily fit in your backpack. Look at people’s tent stakes reviews to make an informed decision. You should also consider buying stakes that are corrosion resistant as they are durable as compared to other stakes. Durable stakes can serve you for years. The best way to ensure you buy stakes that can be reused is to ensure they are easily driven into the ground. Always remember to remove all tent stakes to keep your pack full. If you know what you need, and the terrain you will be adventuring, you can save money by investing in the best tent stakes.